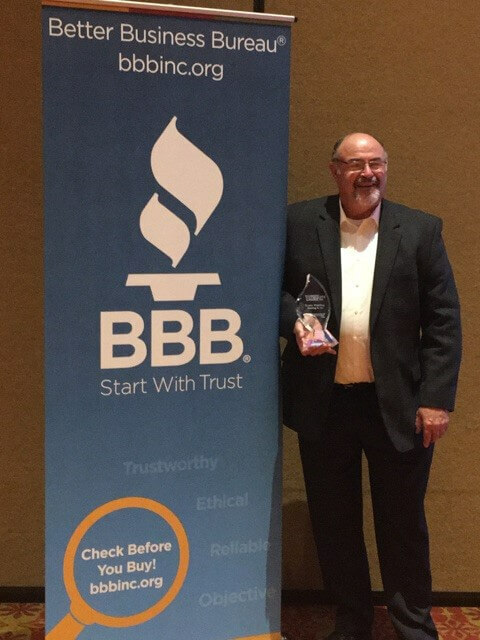 This week, Eyman was honored with a Better Business Bureau Integrity Award. Looking around the room at the businesses nominated and awarded beside us, we were absolutely humbled. Leaders in their industry, pillars of the community, and completely deserving of this award. The Keynote speaker this year, Josh Linkner, had so many insights about disruption, and it got us thinking. If you were carrying a cup of hot coffee across a room and someone bumped into you, whose fault would it be that you were covered in hot coffee? It would be yours. There could have been anything at all in that cup. We’ve all felt the world being jostled lately. We’re all being disrupted. But what comes out of us when we’re jostled is whatever we’ve filled our lives with. It’s in times of great upheaval that we truly find what we’re made of. Omaha has a history of pushing through uncertain times in shows of compassion, strength, and fortitude, and Eyman is grateful to be part of this landscape. We embrace the opportunity to show our clients and supporters exactly what we offer, who we are, and what we stand for. Receiving an integrity award in an age of shortcuts and shortchanging the client tells us that our efforts to always treat our customers, friends and neighbors with respect and honesty mean as much to our community as it does to us. Mr. Linkner made the point that we should not only embrace, but seek out the disruptors. The things that change how we look at business, how we operate on a day to day basis, and to always be willing to think outside the box for our clients. Eyman has always found this principal to be one of the reasons Omaha turns to us when they are facing a unique challenge in their homes or businesses. We welcome a challenge, and we have faith in the team we’ve built to solve Omaha’s biggest plumbing and HVAC puzzles. Our deepest thanks to our team. We set a high standard to join the Eyman family, and every one of you has risen to the challenge. To our administrative team, accepting calls, emails, and messages at all hours of the day and night, never failing to offer kindness and patience to frustrated clients, troubleshooting and establishing communication to our techs, thank you for being the warm heart of our business! To our techs who treat every home like their own, showing respect and compassion on every assignment, arriving prepared and knowledgeable, you make us proud every day! We do big work, but we’re a small business who relies on every member of our team to uphold the Eyman name. We’re proud of every one of our employees who work daily to keep us worthy of this honor. Thank you!